School children visit the Colleville American military cemetery, in Colleville sur Mer, western France, Wednesday, June 6, 2018, on the 74th anniversary of the D-Day landing. U.S. and other allied troops have joined veterans of the D-Day invasion and families of fallen soldiers to mark 74 years since the massive military operation that change the course of World War II. 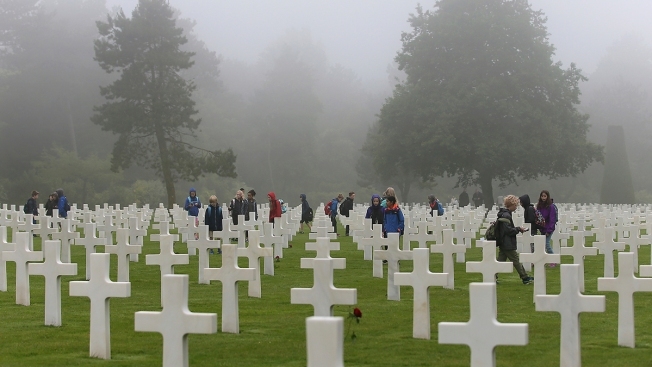 Families of fallen soldiers and dwindling numbers of veterans of the D-Day invasion gathered on the Normandy shore Wednesday to mark 74 years since the massive military operation that helped change the course of World War II.